Please place containers at the curb with the arrows pointing toward the street. Place the containers at least 4 feet away from any poles and or mailboxes and spaced 2 feet from your other containers. Lids on all containers should be closed in order to prevent any items from falling out or blowing out of the containers. What time should garbage and recycling containers be out for pick-up? Please have all containers out by 6 a.m.
What are the Hefty™ Energybag© orange bags? This is a unique program designed to convert previously non-recycled plastics into energy. Plastics collected through the program will be sorted at a local recycling facility and converted into energy used in cement production. Juice pouches, snack bags, microwavable pouches, cake mix liners, cereal box liners, laundry pouches, potato chip bags, frozen vegetable and fruit bags, squeezable pouches, form “to-go” boxes, foam cups, salad bags, plastic cups, plates, bowls and serving ware, dog and cat food bags, candy wrappers, pudding cups, straws and stirrers, and all other non-recycled bags may be placed in the orange bags. 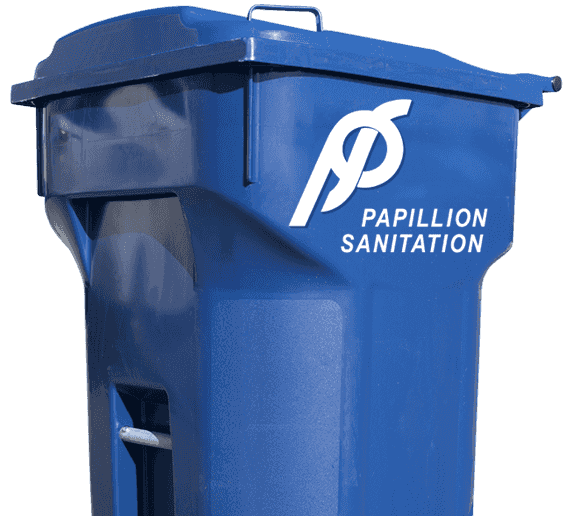 You can purchase these bags through Papillion Sanitation. Each roll comes with 20 bags and each roll is $10.00. We will even deliver them to you on your trash day. If you need some of these energy bags, please call our customer service at 402-346-7800 and your customer service representative will help you. We do not accept glass for recycling. Subscription residential recycling is picked up every other week as it lessens the wear and tear on your streets, as well as the carbon footprint. Commercial recycling pick-up schedules are determined at the time the customer establishes an account. Yes. You can pay your bill online. Please have your account number and invoice. Pay Now. Yes. We take credit cards and there is no fee. We only accept Mastercard, Visa, Discover and American Express at this time. What if I have extra items to be picked up? We offer bulk pick ups on Fridays only. Please call us 24 hours in advance to schedule an extra pick-up or a large item pick-up for an additional charge. There are item restrictions, including Hazardous Waste/Restricted Items. Our office hours are Monday – Friday 8:00 AM – 5:00 PM. We do operate on Saturdays for commercial and construction/roll-off customers, but our offices are closed. Commercial customers are billed on a monthly basis.